When we (ok, Mike) originally made our winter plans, we were going to split our time evenly between Borrego Springs and Lake Havasu City. 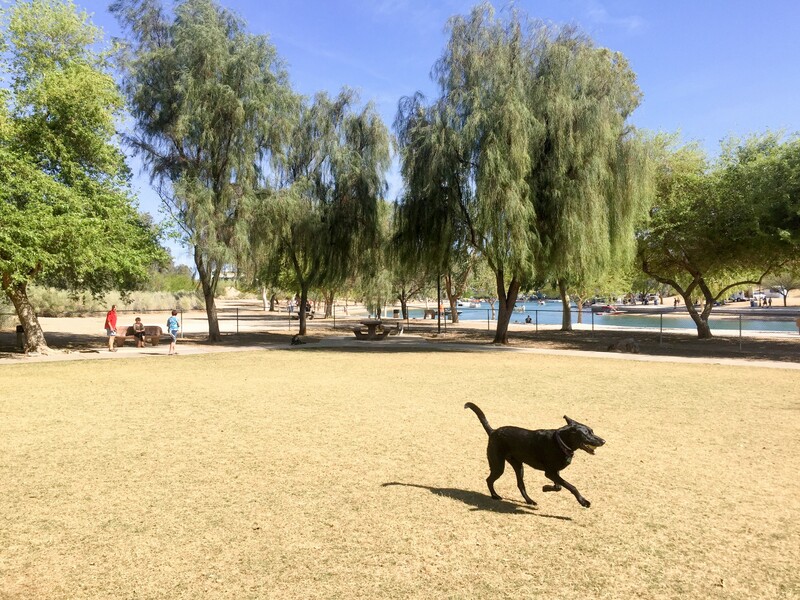 After further research, we (ok, Mike) shortened our stay in Borrego Springs and lengthened our stay in Lake Havasu which turned out to be a good decision. The various sculptures in Borrego Springs were great to visit, but we couldn’t see much else to do there (dogs aren’t allowed on hiking trails in Anza-Borrego Desert State Park). 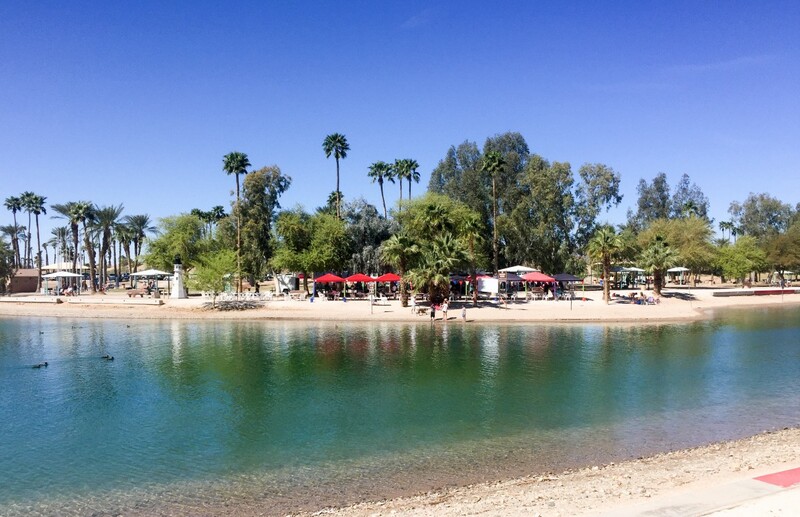 Lake Havasu isn’t a huge city, but it has enough activities to keep us busy for at least a week. Although Lake Havasu City is rather isolated, it’s a popular destination for all sorts of people. Snowbirders come during the winter, college kids for Spring Break, and boaters/jet skiers in the summer. We ended up visiting at the end of the Snowbird season and beginning of Spring Break season. While we’re not big fans of Spring Break, it’s nice to bask in the energy (in short bursts) in the early afternoon before it gets too raucous. We boondocked in the Craggy Wash BLM camping area about 8 miles north of the city. The available area is narrow but meanders several miles back from the highway. We didn’t want to camp too far back since the road is pretty narrow and rather bumpy, so we found an open area about a mile from the road and claimed a spot there. Our solar did a great job keeping us powered and we only needed to use the generator for short intervals on cloudy days. We did, however, finally understand why so many boondockers hate the “construction contractor” generators (the cheap generators with metal bars surrounding them). The fifth wheel closest to us used a very quiet Honda generator for 12 hours a day and we could barely hear it. However, a motorhome that was further away used one of the construction generators and we could hear it easily, all… day… long. Even when we walked down the road for half a mile, we could still hear it! 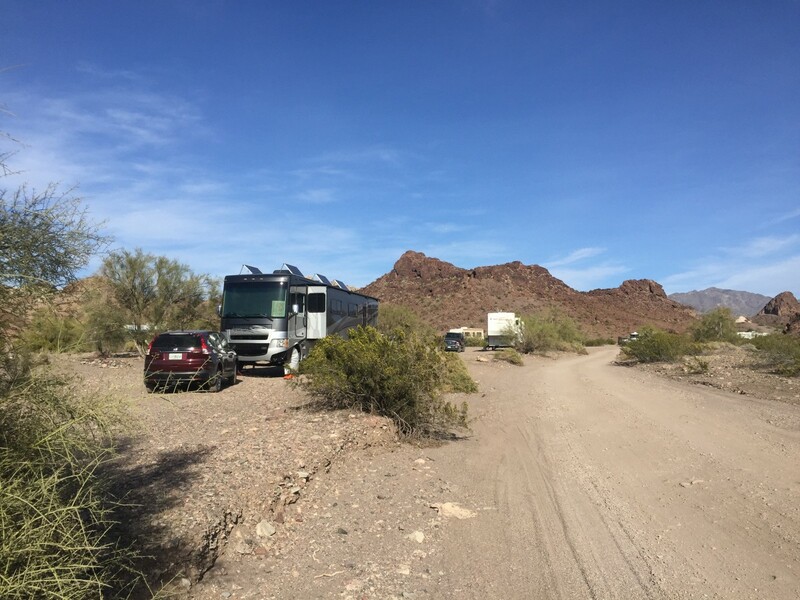 Lake Havasu is probably the last boondocking we’ll be doing for the rest of the year. 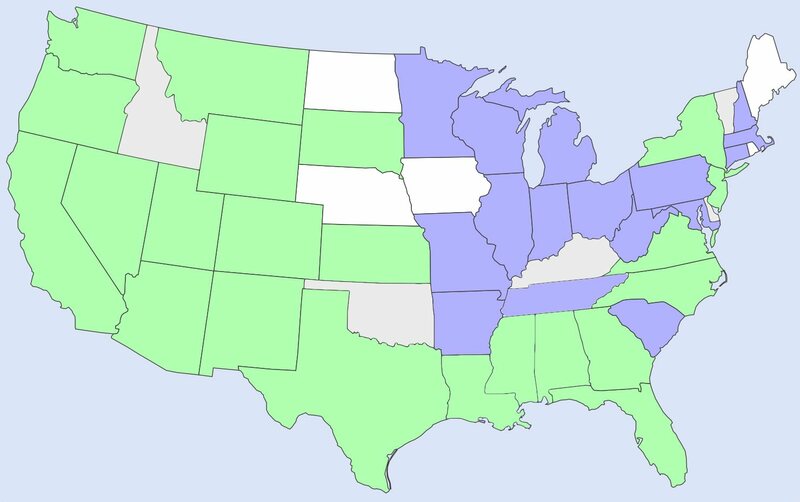 As the weather gets hotter, it becomes more difficult to keep the RV cool without air conditioners (not easy to do with solar panels), and we won’t be going very far north this year. While Mike and I can deal with a warmer interior, Opie becomes very uncomfortable. ‘Course I’d feel the same way if I couldn’t sweat and had to wear a long black fur coat! 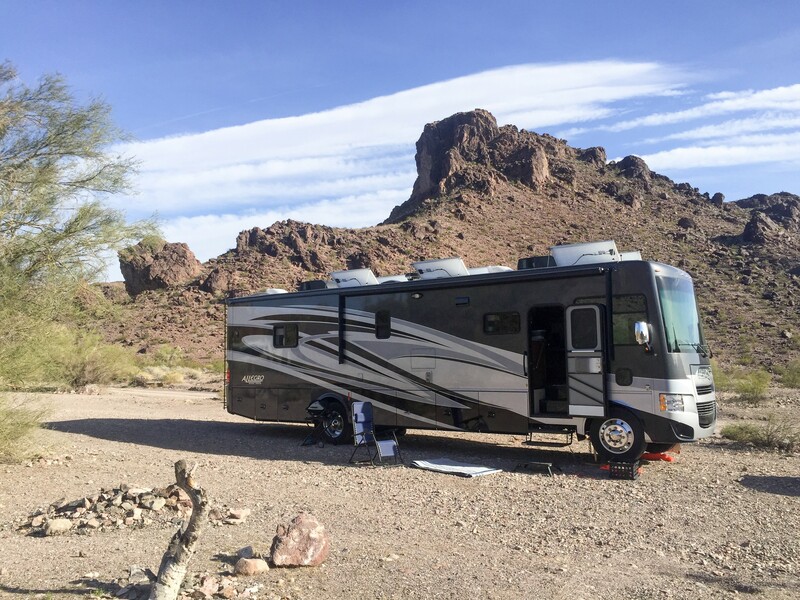 This year we’ve boondocked for 35 days, saving about $1,200 in campground fees (our RV parks and campgrounds have been averaging $35/night with fees and taxes). Saving money is a nice side benefit, but we do this because we enjoy the freedom, space, and privacy provided by dry camping out in the middle of nowhere. We’ll definitely be on the lookout for more boondocking opportunities next winter. 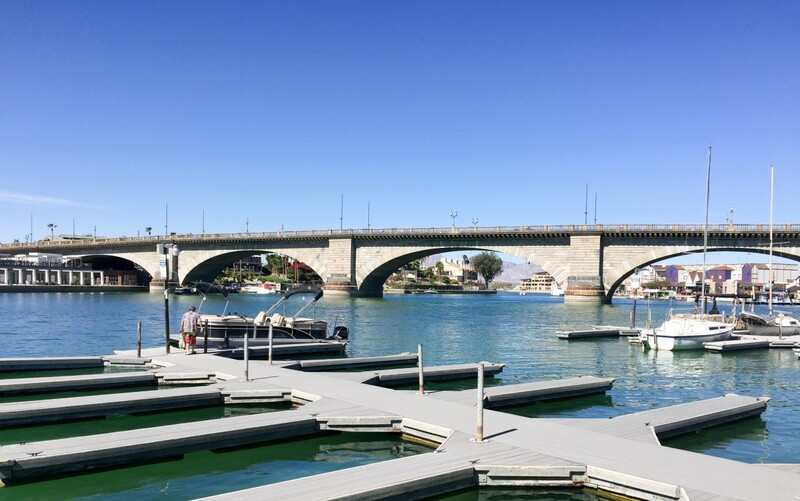 Lake Havasu’s iconic landmark is the actual London Bridge which used to span the Thames River and now spans the Bridgewater Channel, a part of the Colorado River. The founder of Lake Havasu bought the bridge in the late 60s and had all the masonry blocks meticulously numbered and shipped to the US, where it was then reconstructed. You can walk or drive across the bridge (we did both) and enjoy the scenery of the area. We spent almost all of our time visiting the Bridgewater Channel area. It makes for a very pretty stroll and it’s very dog friendly! There’s also a great dog park right next to the channel so Opie was in heaven. We’d play in the dog park until he got too hot, then RUN into the channel and soak in the water until he was ready to go back to the park to play more. Rinse and repeat for a couple of hours and we had a wet, tired, happy dog ready to head home to nap. 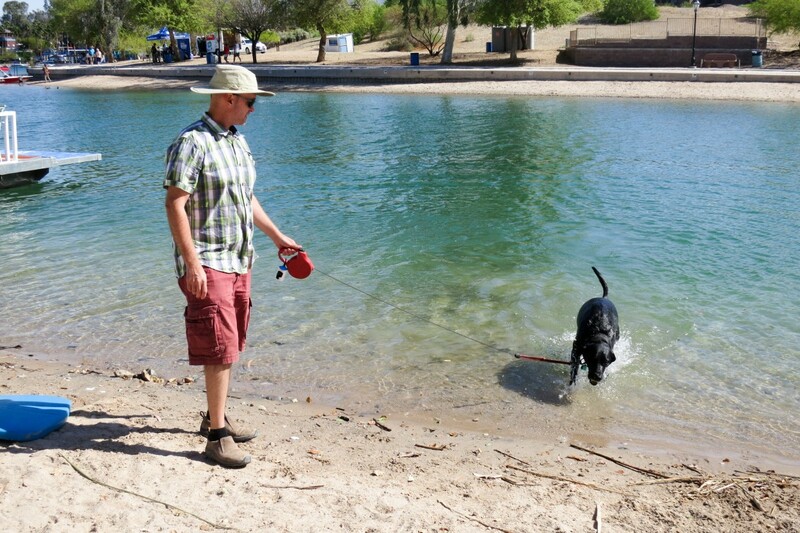 We ended up taking Opie here every other day to bask in play and water; I think he was very very sad when we left Lake Havasu. 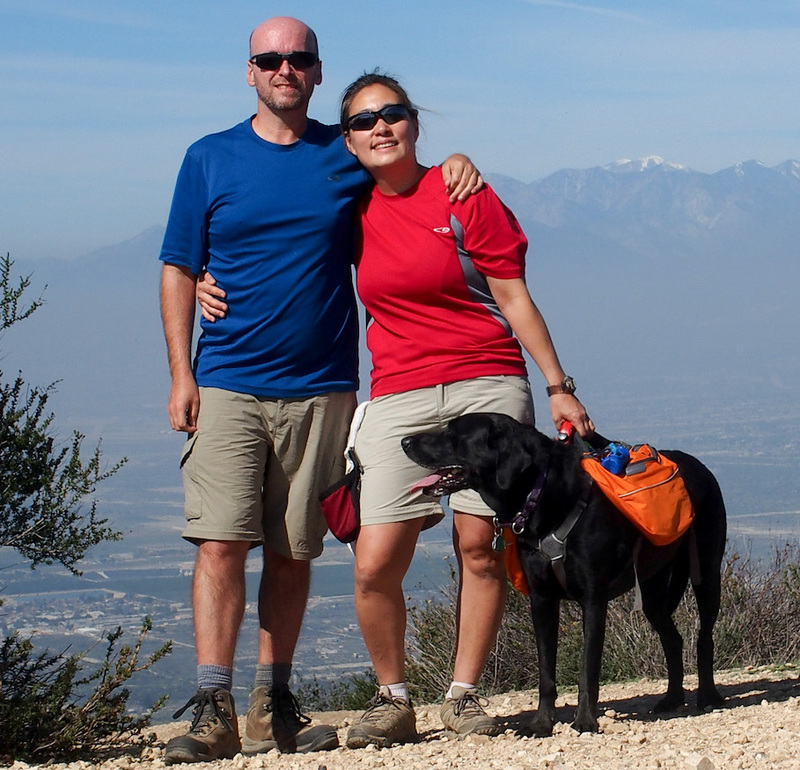 We did have a dog-free adult-only day too! 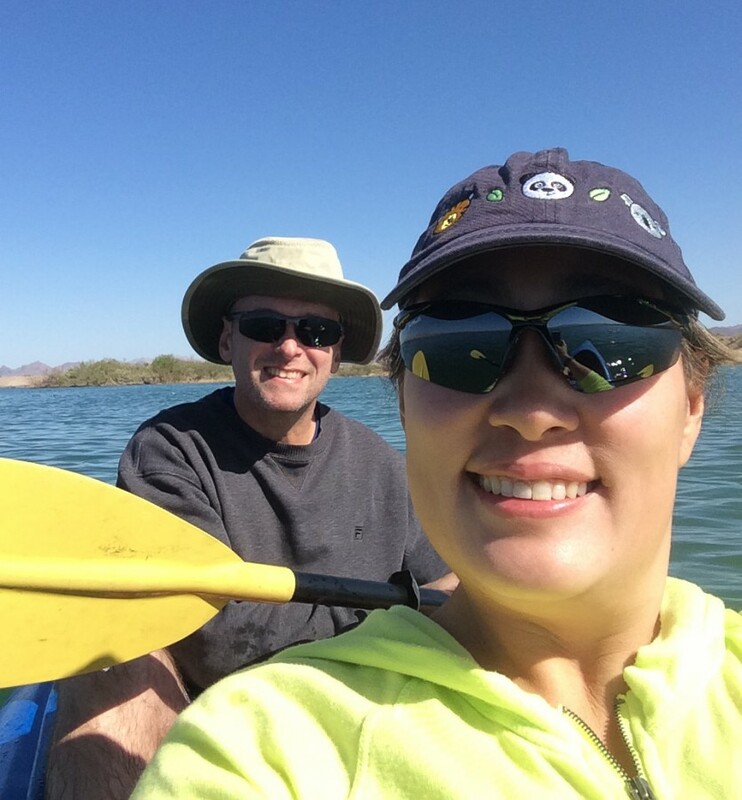 We rented a kayak for the day and enjoyed the gorgeous mountains and calm water. We started at Mesquite Bay, about 4 miles north of London Bridge and took a leisurely ride down the river and into the channel. Lake Havasu is also known for their 1/3 scale functional lighthouse replicas scattered around the shores and we were able to see a handful of these during our kayak ride. We paddled past London Bridge, moored our kayak on the beach, and ate lunch while bemusedly observing the Spring Breakers out in their cabanas blasting music (were we ever that young??). The Colorado River north of Lake Havasu has almost no current so it was just as easy to paddle upstream back to our starting spot. While here, we finally got to meet up with Eric and Brittany of RV Wanderlust, another full-time RVing couple who started out around the same time as us. We met up and had some really good ice cream at Scoops in town. We only overlapped by one day, which is unfortunate since they are board and card gamers too. Hopefully we’ll meet back up with them in the future and have more time to hang out and play games. I think both Mike and I enjoyed our week at Lake Havasu and we would like to come back next year. There are some great hiking trails, Topock Gorge (great for kayakers), and the Wildlife Refuge that I’d really like to visit next time. So glad we got to connect with you guys! The time was too short. Games will happen next time! Excellent! We look forward to it! Been following you guys for a while now. Didn’t know you were board gamers and card players. Our type of people!! Have you tried Akrotiri? A great board game for two. Got it for the wife’s birthday a couple of months ago and we love it. We plan on hitting the road in a couple of years. Maybe we will be able to meet up some day and enjoy a friendly game of Settlers of Catan (if you have tried that one yet – better for three or four players). Enjoy and be safe on the road. We haven’t tried Akrotiri yet, thanks for the recommendation, I’ll have to check it out. I’m always collecting ideas for two-player games since most of the games we have/played are for 3+. Love Settlers of Catan (so many bad jokes….need wood for sheep). We would love to meet up with you guys. If we pass near your place, let us know. I’d love to find new gamer friends! Good luck on your road plans, hopefully we’ll run into you on the road someday! You must be a Big Bang Theory follower (based on your wood for sheep reference)! Lately, we’ve been concentrating on finding good two-player options, and Akrotiri certainly has proven to fit that bill. You won’t be disappointed if you have the opportunity to purchase it. We live in Central Iowa (not a real popular hot spot for fulltime RVers – even for just passing through). However, if you happen to have plans to be in our neck of the woods, give me a shout. Would love to share some good times and gaming with you guys. It’s pretty funny, we are Big Bang fans, but haven’t watched it since we went on the road, so I didn’t know they played Catan on the show. Hm, not sure when Iowa makes it on our itinerary but if we do, I will definitely reach out. Thanks for any info that you can add. You have a great and very useful site! I’ve been reading and learning a lot! Thanks! Congratulations on the RV! We were all newbies at one time so asking questions is always great! We use leveling blocks anytime the ground is unlevel enough that our tires are going to leave the ground. Usually we find out by auto-leveling, then watching our tires. If they lift off, then it’s time to re-level with blocks. We used to use 4×6 blocks, but we found the weight of the RV would crack them over time so we moved to the orange plastic blocks. I would definitely recommend having some sort of blocks, not only for unlevel areas but some RV parks require blocks under your jacks to prevent damage to the asphalt. Hope that helps! Safe travels, and I hope we’ll meet up on the road. That was great information. As I said in a previous post, we are newbies too. Other than a local “shakedown” cruise at our county campground (Oak Hollow Lake Campground High point, NC – very pretty) we have yet to get Bertie, short for Big Bertha, on the road. We are planning a 5 day trip to Willowtree in SC as our first outing. We know so little about the mechanics of leveling and this was helpful. So, another question – why and when do you use chocks? Hi Jean! Congratulations on Bertie, love the nickname. :) I hope the weather in SC is better than the weather in DC, most of our friends are complaining about the cold spring so far. 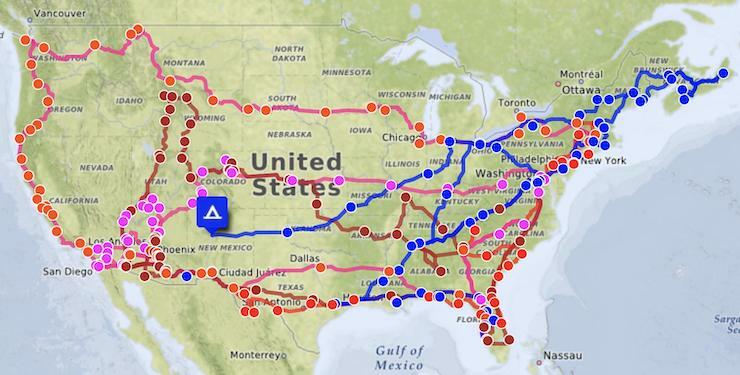 Thinking of doing longer road trips once you get the hang of it? Since we have a MH with it’s own brakes and parking brake (like a car), we only use the chocks if we’re on an incline or near the edge of a drop-off. If we’re level and in a stable location, we just depend on leaving Rover in Park and putting on the emergency brake. I know trailers and fifth wheels use chocks regularly though. Hope that helps!